I love the sweet earthiness of beets with the bright greenness of lemony herbs. I used lemon thyme, chervil, and tarragon, but you could use any herbs you like in your garden. This was a nice summery combination of textures and flavors. And I used the beets and their greens. In a large bowl combine the sugar, yeast and warm water, and leave in a warm place till frothy. Add the flour, cornmeal, salt and olive oil. Add just enough warm water to pull it all together into a kneadable dough. Knead for about five minutes, then put in a lightly oiled bowl for a a few hours to double in bulk. Preheat the oven to 425. Peel the beets and slice in half across, and then into half-moons about 1/8th inch thick. Coat lightly with olive oil and spread in an even layer on a baking sheet. Bake, turning often, until they’re starting to become crispy, about fifteen minutes, depending on how thick they are. Set aside. Wash the greens and remove the stems. Chop quite fine. Warm olive oil in a large skillet, add garlic and rosemary and stir and cook until the garlic starts to brown. Add the greens and stir and cook until wilted but still bright. Add a little water if necessary, but cook until the pan is quite dry. Set aside. Combine the eggs and pin nuts (minus a handful) in a large bowl or food processor. Add the cheese, milk and herbs and mix to combine. Don’t put the ricotta in the food processor, it will become too smooth. Stir it in after everything’s mixed. Stir in the cooked greens. Lightly oil a 9 or 10 inch cake or tart pan and press the dough into it, working it up the sides. It should be quite thin. Bake for about five minutes, until it just loses it’s shine. Pour in the beet green and egg mixture into the crust. Arrange the roasted beets on top, or just scatter them. Scatter a handful of pine nuts over the top. Bake for about 20 minutes until the filling is puffed and starting to brown. Let sit for a few minutes to set, then slice and serve. 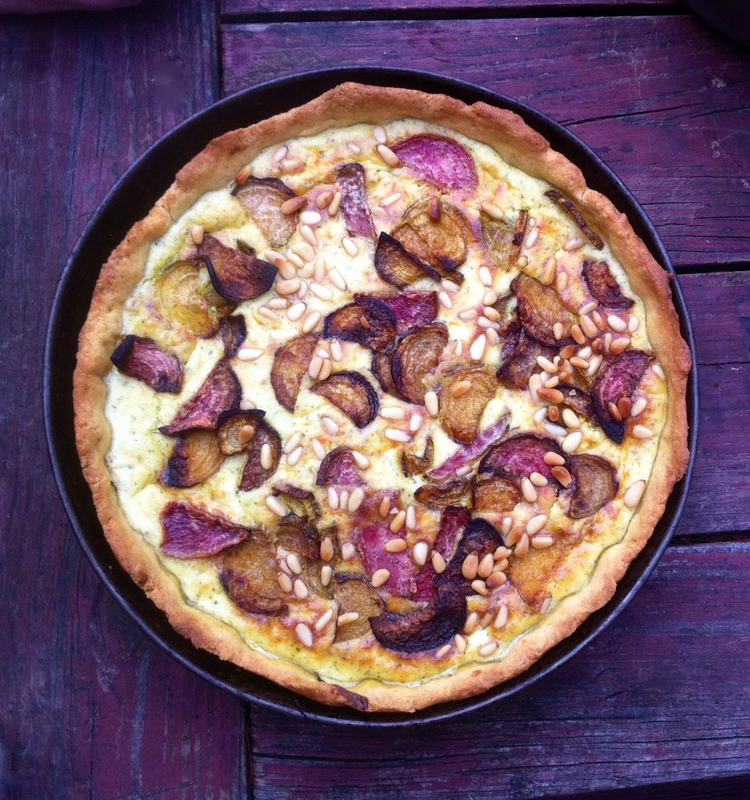 This entry was posted in basic pie filling, crust, pie, spring tart and tagged beet, chervil, epictetus, lemon thyme, ricotta tart, tarragon by Claire. Bookmark the permalink.